Track sales leads captured in a Jotform form automatically from our simple sales tracking software. Jotform helps you create great looking online forms. With Jotform, capturing incoming sales leads becomes a breeze and you don't have to write a single line of code while at it! ClinchPad is an alternative to traditional CRM software that helps small teams to efficiently track sales leads and better manage their sales pipeline. The forms that collect prospective customer information are the lifeline of every website and marketing campaign. Jotform assists you in creating gorgeous web forms in a few clicks. Making sure that all these sales leads collected painstakingly doesn't go unattended should be your top priority. Why not use this opporunity to sync up your lead generation forms automatically to a simple sales CRM? 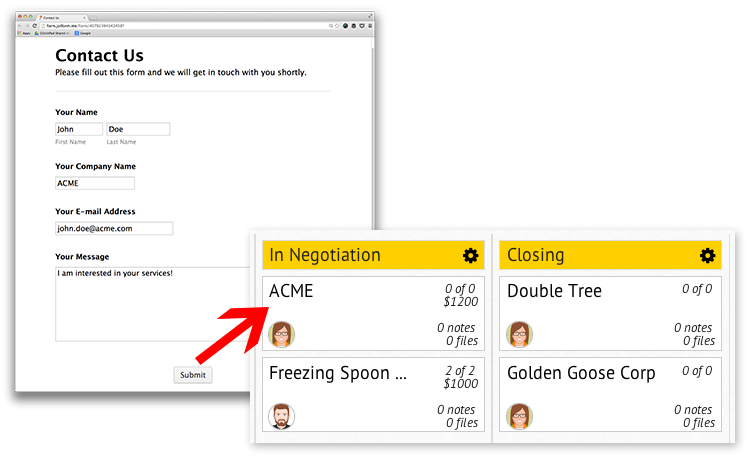 ClinchPad is a lead management software that saves sales teams a ton of time. For starters, you don't have to rebuild your sales leads database everytime there is a form submission. In a quick, real time handshake, our sales tracking software adds leads generated via Jotform to their respective sales pipelines. Isn't that the fastest way to top up your sales funnel? Sign up for accounts on both Jotform and ClinchPad if you don't have them already. Create an form to capture leads on Jotform. Follow the instructions in this support article on integrating ClinchPad with Jotform. You're done! Now anytime a Jotform form is submitted, it'll appear as a lead in ClinchPad. ClinchPad is FREE forever for 100 leads. All features. Unlimited users.